Once my Mortgage Lender Starts the Foreclosure Process, Can I Stop It Without Having to File Chapter 13 Bankruptcy? Florida foreclosure proceedings are non-judicial in nature. This means that your lender can institute foreclosure proceedings that will result in the sale of your home on the courthouse steps, all without having to go to court. The foreclosure process begins with a “default.” Under the terms of your home loan, you agree to make regular payments (usually every month). Your loan most likely also provides that if you miss a payment, your loan is considered “delinquent.” Usually, mortgage companies will allow a two or three month delinquency before declaring that your loan has gone into default. Your mortgage loan agreement specifically describes what is meant by a default. Every loan is a little different but as a rule, when a loan goes into default, the entire unpaid balance is declared due. Under such an “acceleration clause” you would, upon default, owe hundreds of thousands of dollars. Now if you happen to win the lottery and have several hundred thousand dollars sitting around, you can pay off your loan. Assuming that this is not the case, your failure to tender the full balance within a set time (such as 7 or 14 days) will result in the start of a formal foreclosure process. If you have failed to abide by the terms of your installment loan and if you do not have the cash to pay off your mortgage, the foreclosure is the process by which your mortgage company takes title to your property away from you. Once a loan is accelerated and the file turned over to a foreclosure lawyer, it is very difficult to stop the process. We sometimes speak with clients who are communicating with their lender even after the foreclosure advertising is going on. Sometimes lenders will agree to stop the foreclosure if very specific terms are met. However, it has been our experience that actually hammering out an agreement that stops a foreclosure is very difficult. Several of our clients report that they felt that the lender was leading them on about the possibility of stopping foreclosure, only to receive a final “no deal” a day or two prior to the actual foreclosure. We are not saying that negotiated deals to stop an active foreclosure is impossible, but we advise you to be very careful not to allow too much time to pass, and certainly do not assume that a deal can be struck while you do nothing to prepare for the bankruptcy option. We have also heard from clients about “foreclosure relief” companies that promise to intervene on behalf of homeowners to stop foreclosures. Here, too, you should be very careful. Check the reputation of the company with the better business bureau. Ask for references. Any by no means discount the possibility that you may need to file a bankruptcy should negotiations break down or if the foreclosure relief company disappears. Are There any Government Programs Available to Me that Can Stop my Foreclosure? The federal government has instituted several programs to help stem the tide of foreclosures, but these programs have had limited effect because most of these programs rely on voluntary actions by banks to refinance or restructure loans, and these mortgage lenders have not been enthusiastic about taking these voluntary actions. According to the National Association of Consumer Bankruptcy Attorneys (NACBA), government foreclosure programs have done very little to reduce the numbers of foreclosures. The HUD web site at http://portal.hud.gov/portal/page/portal/HUD/topics/avoiding_foreclosure offers a number of counseling resources and information pages. Our experience at Clark & Washington has been that foreclosure prevention programs that rely on voluntary loan modifications by mortgage companies just do not work. From our standpoint, the biggest issue has to do with time – it can take four to six months for a loan to be considered for a modification, during which time that loan grows more and more delinquent. If the modification is refused or if the terms are not favorable, our client ends up looking at Chapter 13 to stop a foreclosure, but with an additional six months or more missed payments that have to be absorbed in the Chapter 13. Our position remains – if you are facing a potential foreclosure, seek personal legal attention from a law firm like Clark & Washington that has your interests at heart and that understands the bankruptcy laws thoroughly. Are there Alternatives to Bankruptcy that can Stop a Foreclosure? use of federal government foreclosure prevention programs – as discussed elsewhere on this web site, the federal government has a number of programs designed to help homeowners restructure their delinquent mortgage debts. Can a Chapter 13 Really Stop a Looming Foreclosure? Chapter 13 stops an imminent foreclosure by creating an automatic stay as to all creditor action. The automatic stay of a bankruptcy case is what makes a bankruptcy filing so powerful. With very limited exception, the minute a Chapter 13 case is filed, all creditor action must come to a stop. If a creditor intentionally continues adverse action against a debtor who has filed bankruptcy that creditor can be sanctioned. The automatic stay of Chapter 13 applies even if the creditor is not aware that a bankruptcy filing has commenced. For example, if your house was scheduled for a foreclosure at 10 AM on “foreclosure Tuesday,” and your attorney filed a Chapter 13 case at 9:51 AM, that foreclosure would be void even if the foreclosing mortgage company was unaware of the bankruptcy filing. A good faith third party purchaser would not be entitled to claim ownership of your house and any title transfer would have to be reversed. Automatic stay protection can be less comprehensive for second or third bankruptcy filings. Click on the link to read more about how the 2005 Amendments to the Bankruptcy Code changed the automatic stay rules for repeat bankruptcy filers. 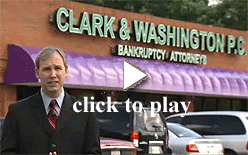 Obviously, the attorneys at Clark & Washington strongly suggest that you not wait until the day or even week before your foreclosure to start the Chapter 13 bankruptcy filing process. 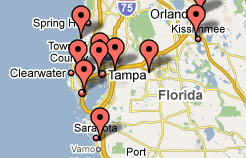 Instead, call us at (813) 345-5954 the minute you realize that your home is under the threat of a foreclosure. The United States Bankruptcy Code requires debtors filing under Chapter 13 or any other bankruptcy chapter to list all of their debts. You cannot file a Chapter 13 to stop a foreclosure, but leave out your car lender, the IRS, your credit card companies or your medical creditors. If you owe money to anyone, that debt must be listed in your Chapter 13 case. When you and your attorney prepare a Chapter 13 plan, similarly situated creditors must be treated the same. For example, if your plan provides that unsecured creditors get paid 10 cents on the dollar, all unsecured creditors – credit card lenders, medical providers and holders of unsecured personal loans – will get 10 cents on the dollar. You cannot, for example, create a plan provision that pays your brother back at 100% but your credit card lenders 10%. You also need to be careful about making lump sum payments to selected creditors prior to filing bankruptcy. Section 547 of the Bankruptcy Code contains specific language about prohibited transfers known as “preferences.” A prohibited preferential payment is one that is made out of the ordinary course of business on an existing debt. If the payment is to a third party the “look back” is 3 months from the date of filing. If the payment is to an “insider” (relative, company that you own shares in) the “look back” is 1 year. Similar prohibitions apply if you were to try to “give away” some of your assets to protect those assets from creditors in bankruptcy. These types of transfers are prohibited by the Code and and delay by months or years your ability to file. Your Clark & Washington lawyer can explain how the rules against preferences or asset transfer may apply to you. As always, do not hesitate to call our office before making such a transfer – we are happy to help and we can save you a great deal of difficulties if you call us before you make any major financial decisions when you are considering bankruptcy. Can Chapter 7 be Used to Stop Foreclosure? Although Chapter 13 is correctly known as the most common type of bankruptcy to stop a foreclosure, it is not the only type of bankruptcy proceeding that will create an automatic stay. Chapter 7 liquidation bankruptcy filings will stop a foreclosure.